Ohio Gov. John Kasich is now barely taking tenth place in the 2016 Grand Ol’ Party’s Presidential Primary Extravaganza, and the Columbus Dispatch is breathless. Six stories on the Dispatch politics page today relate to J.R. Kasich’s presidential ambitions. The rest of us hotly await Yahweh to waive the green flag on Kasich’16. Critics are calling the prospect of Kasich 4 Prez “sheer fun” and “pure entertainment.” I myself have been an outspoken advocate for Kasich wasting massive amounts of time and money on a doomed mission to slake his presidential thirst. And he’s well on his way, doubling his average support in Republican primary polls since last summer from 1 percent to 2 percent, now jostling with failed CEO and failed U.S. Senate candidate Carly Fiorina in a nail-biting tie for tenth. A poll out today from Quinnipiac University shows five – that’s right, five – Republican presidential candidates tied for first. The quintet: Former Florida Gov. Jeb Bush, retired neurosurgeon Ben Carson, former Arkansas Gov. Mike Huckabee, U.S. Sen. Marco Rubio of Florida and Wisconsin Gov. Scott Walker. Each checks in with 10 percent in the national survey. But with the Republican National Convention in Cleveland more than 14 months away, the real competition is at the bottom. Fox News will invite only those who rank in the top 10, based on an average of national polls, to the first GOP debate on Aug. 6 – also to be held in Cleveland. This Quinnipiac poll helps Ohio Gov. John Kasich, who squeaked into a 10th place tie with former Hewlett-Packard CEO Carly Fiorina. If he keeps it up, Kasich is on track to be polling near 4 percent by the time of Ohio’s primary next March. He’d have to unleash all of his prickly charms to ratchet those numbers up. But now, according to the Dispatch, our dear legislature is moving the state’s primary from March 8 to March 15 to maybe, possibly, perhaps give Kasich a little, um, structural advantage. It would allow Ohio to make its primary winner-take-all instead of delegates being divided proportionally. Or as the Dispatch puts it, “Ohio lawmakers set the table for Gov. John Kasich to potentially take all of the Buckeye State’s GOP presidential delegates in one swoop next year.” The fork goes on the left, and can you do something festive with the cloth napkins? The fun in the sun didn’t stop there. Down in South Carolina, Kasich is telling folks he’s no fan of gerrymandering, but it’s up to states to change it. Being governor of the preposterously-gerrymandered Ohio, one might think Kasich would, y’know, lead the effort to install a fair redistricting process. One would be wrong. It’s a wonder what a gerrymandered state legislature can do for one’s presidential ambitions. Also on the list of hilarious things John Kasich said in South Carolina is that America’s corporate taxes are too damn high. I have to guess he means everyone down at the country club. 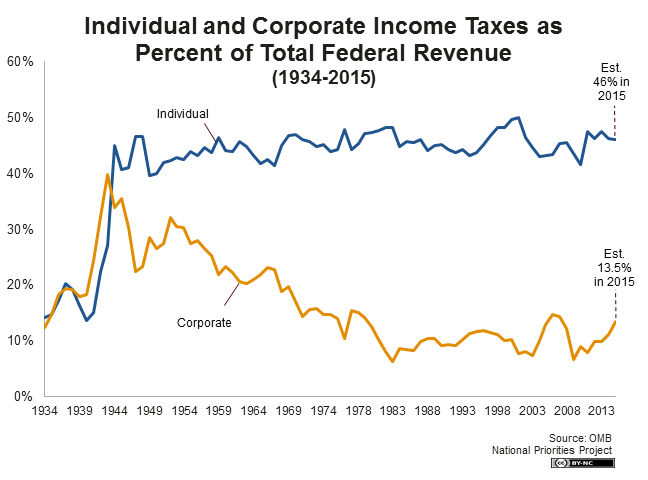 Right after World War II, U.S. Government revenue was funded more or less equally by corporate taxes and income taxes, with about 38 percent coming from each. 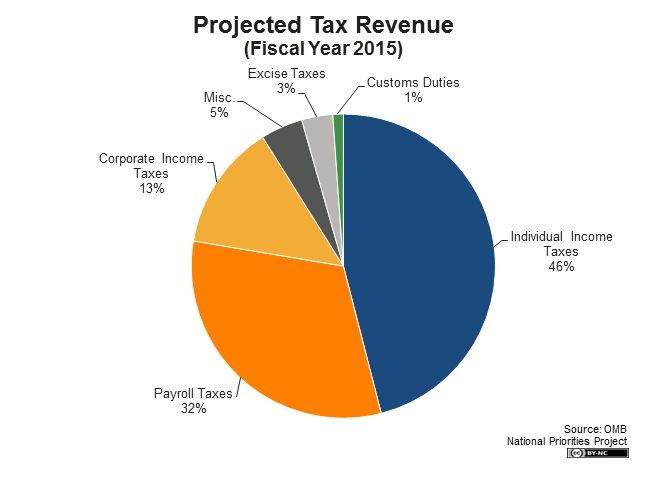 Now, corporate taxes fund 13 percent of revenue, and individual income taxes fund about 46 percent of revenue. And hold onto your butts, folks, Kasich hasn’t suddenly warmed up to individual income taxes. He wants to re-run Steve Forbes’ flat tax plan (a la Rick Perry in 2012). Kasich wants to cut the federal income tax for corporations and individuals. His preferred vehicle, he said, might be the plan championed by publisher and former presidential candidate Steve Forbes: a flat tax, rather than a system with higher tax rates for higher incomes. The best part is that he’s sticking with the Forbes/Perry idea that folks should be able to choose between their current tax rate and the “flat tax” rate. Republicans like to make much hay over the fact that many Americans (see: children, the elderly, and the very poor) have such a small income they don’t pay any federal income taxes. Of course these low-income people are likely not to choose to create a fresh, new financial burden for themselves. And even though the income tax rate for those at the top has fallen from over 90 percent after WWII to 39.6 percent now, the rich are still pretty cheesed off about having to pay over 65 percent of the country’s income tax revenue. I think they’ve made it clear they’d choose the lower, flat tax rate. So the upshot of Kasich’s plan is this: Corporations pay less. The rich pay less. The federal budget gets less money. But oh by the way it must be balanced, so something must be shredded. Because Kasich says he’s cool with boots on the ground to fight daesh in Iraq, it’s not likely to be the military. That leaves what’s left of the social safety net. Meanwhile, J. Richard Kasich is a blunt, straight-talker without the “edge” of his pal Chris Christie, gushes “GOP operative” John Watson to the Atlanta-Journal Constitution. It’s his Midwestern ‘tude, apparently. Watson now owes every Midwesterner a beer at their local for this terrible slander. Kasich personifies the American Midwest about as well as Bertram Wilberforce Wooster. And finally, Kasich continues to signal that once the good Lord gives him the go-ahead, he will skip past the God-fearing folks of Idaho, and lay his eggs in the New Hampshire basket. Ohio Gov. John Kasich named a veteran New Hampshire political consultant today to head that state’s branch of Kasich’s campaign committee. Paul Collins worked for New Hampshire Gov. John H. Sununu and in the White House as a special assistant for political affairs under Sununu to President George H.W. Bush. (The Dispatch). Ain’t no party like a former Sununu staffer party ‘cuz a former Sununu staffer party don’t stop.